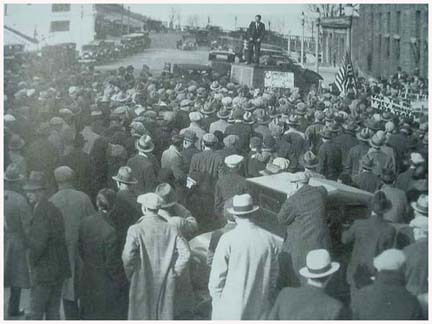 Communist-led Unemployed Council demonstration at Tacoma City Hall, 1931 (courtesy of Tacoma Public Library). 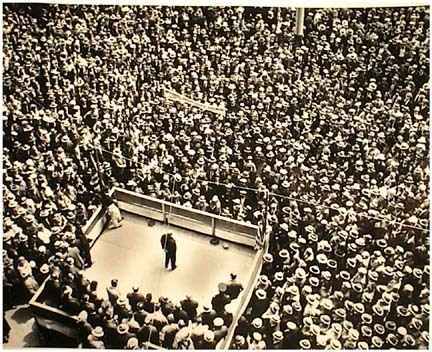 If ever a political credo was vindicated by wider events, the stock market crash of October 1929 reinforced the CP USA’s goal to overturn the capitalist system. The Crash personified capitalism at its most obvious failing, and was, as well, Communism’s greatest chance to establish the case for a Marxist, worker-based economy and political system. By raising the political consciousness of the disaffected and poverty-stricken unemployed, the Communists could foment the revolutionary overthrow of the capitalistic system. Or could they? Could Washington State, which had a relatively small population with a high degree of industrialization, be the place to instigate change? 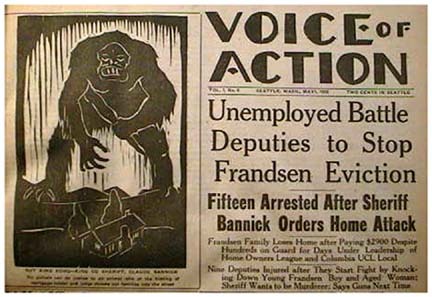 Published by the Seattle Labor College and edited by Carl Branin and Hulet Wells, The Vanguard was the voice of the Unemployed Citizen's League. 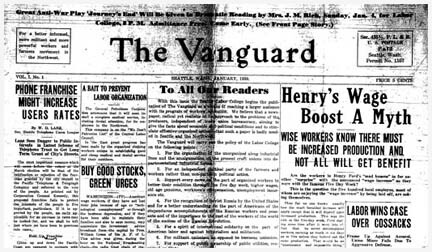 For more on this important newspaper see the Vanguard report by Erick Eigner. Communists were quick to attack the rival organization. Herbert Benjamin, a national CP leader of the Unemployed Councils, labeled the UCL a “social fascist” effort that would lead to betrayal of the workers and urged Seattle Communist Party officials to build the Unemployed Councils. The Workers Alliance and Washington Commonwealth Federation replaced the Unemployed Councils and UCL in 1936. With help from the Workers Alliance, Mrs. Toll, a 63-year old chambermaid, wins a law suit to enforce the minimum wage law. (Sunday News April 8, 1937) While the CP-backed Unemployed Councils offered a hopeful future of jobs, respect and benefits in a classless society, they did not match the concrete offerings of firewood and sustenance that the UCL commissaries were providing free of monetary charge. Given the choice, it appeared that most Seattle unemployed preferred the immediate relief attained through wood and food than some vague promise of salvation through Marxism. Besides, Wells and Branin, both experienced in labor issues, also worked on a political agenda to get bills through the Legislature that would provide unemployment insurance, a jobs program and cash relief. 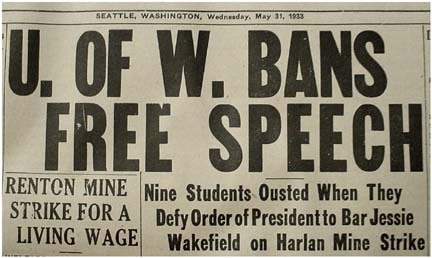 Tensions erupted between Communists and these socialist organizations when various groups representing the unemployed embarked on a march to the State capitol in Olympia on July 4, 1932. The goal was a show of support intended to change the mind of Governor Roland Hartley, a traditional, pro-business Republican, who had steadfastly denied state funds for workers’ relief efforts. Hartley refused to meet the demonstrators, though he did meet a smaller delegation, including Hulet Wells, two days later. Despite the march’s obvious failure to affect state policy, it did provide visible proof of Communist intent. since taking the oath of office, there has been a continuous evasion of doing anything for the working class. 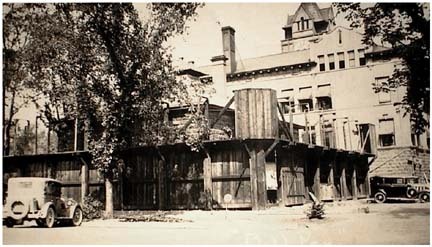 Instead, the Bankers were provided for first – when the banking holiday was declared: huge loans (gifts) were made to the railroads and Big Business: a military system of forced labor camps was instituted in the form of Civilian Conservation Corps under the original name of ‘Federal Unemployed Reserves,’ and now there has been enacted the National Industrial Recovery Act, giving to the President all of the powers of a DICTATOR. But as the New Deal emerged, Communists in Washington would also continue the practice of “boring within” to achieve leading roles in the projects relating to the unemployed. In the mid 1930s the Unemployed Citizens League would be replaced by the Workers Alliance, an organization that attempted to unionize and represent workers employed on WPA (Works Progress Administration) projects. Similarly the Party would organize its way into the Washington Commonwealth Federation, Washington Pension Union and various labor unions. [iii] Albert Francis Gunns, Civil Liberties and Crisis: The State of civil Liberties in the pacific Northwest, 1917-1940 (Ph.D. Dissertation, University of Washington, 1971), 123-62. [vii]M.M. London was Executive Secretary of United Producers of Washington. 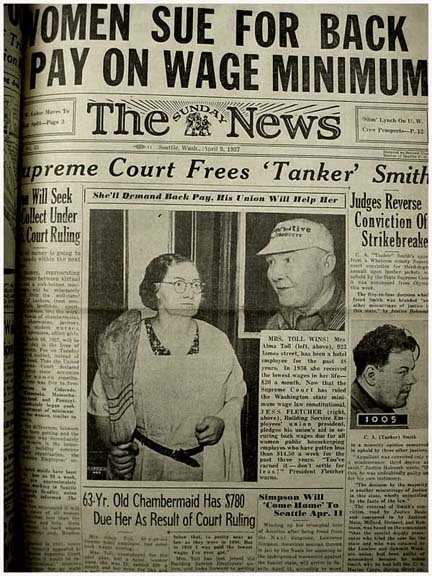 See Terry R. Willis, Unemployed Citizens of Seattle 1900-1933, Hulet Wells, Seattle Labor and the Struggle for Economic Security (Ph.D. Dissertation, University of Washington, 1997). [viii]Max and Wakefield were later named in the masthead for The Voice of Action, a CP-run weekly started in competition to The Vanguard. [ix]Lester Hunt, Seattle Post Intelligencer, July 5, 1932. [xiii]Accurate figures are hard to determine. Blood in the Water (John McCann, Seattle: District Lodge 751, IAM&AW, 1989), a history of the International Association of Machinists Lodge 751, quoted a peak membership in the state of 6000; Jim West, a Communist Party work in Seattle in the late Thirties, said in a March 2002 interview that membership was “above 3000” in the state during the Thirties.